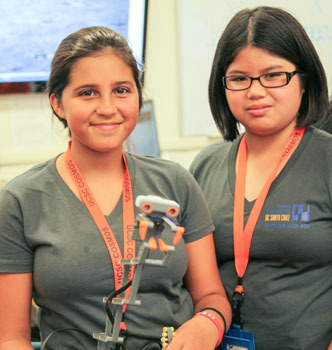 Alexia Leon, 13, of Castroville, (left) and Brigette Cruz, 13, of Salinas, made a robot that senses motion and tries to smack anything that approaches. The girls, all of them 8th and 9th graders, use the programming environment Scratch to make games and animations, and Lego NXT kits to build microprocessor-equipped robots that can perform a wide variety of tasks, from smacking a ping pong ball across the floor to negotiating a tricky obstacle course using sensors. Their week also includes a visit to a local tech company (of which we’ve visited Cruizio and Plantronics this year), and tours of various Baskin School of Engineering labs, from bioengineering to digital games.